View All Nutrition 2000 Products. Naturally promotes healthy prostate gland, bladder and kidney functions. The statistics are shocking and seem to be even more significant with the advent of the baby boomers reaching there 40's. The number of men with prostate problems over age 40 is now about 60%, with men over the age of 50 accounting for 75% of all prostate problems. The Prostate is the source of most problems with the male genitourinary system. Nearly every man over the age of forty-five will have some enlargement of the prostate. 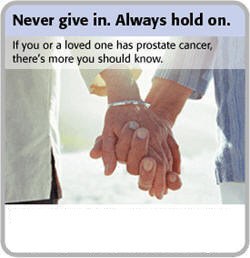 Most prostate problems don't become troublesome until a man reaches the age of sixty. The search for a natural remedy for prostate problems have taken giant steps in the past few years. 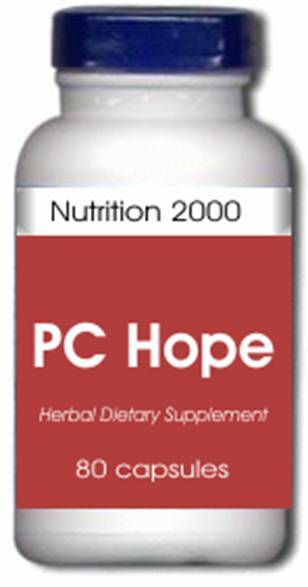 PC Hope™ is specifically formulated with all-natural ingredients that have clinically been shown to alleviate symptoms associated with prostate enlargement and infection, without many of the side effects associated with conventional medications and treatments. Because phytosterols may have some estrogenic effects, some patients complain of breast tenderness at the larger dosages. This is to be expected and will disappear as the dosage is reduced. Always check your blood clotting factors in advance, by getting a doctor ordered PTT blood test. This book provides the powerful message that prayer changes things. Dr. Lonnell Johnson's personal testimony provides a unique strategy of how faith, prayer along with our Prostate Cancer Protocol allowed him to defeat prostate cancer. Clinical observations have indisputable proof of reishi's efficacy against cholesterosis, arteriosclerosis, hypertension, fatty liver, hemorrhoid, tooth-infections, obesity and various problems that arise from high serum cholesterol level compounded by a lack of blood circulation. Reishi is also recognized to have some effect in cases of stroke, cerebravascular accident, coronary insufficiency, myocardial infarction, phlebitis etc. - problems that arise directly from arterial blockage. Furthermore, it is found to be effective in treatment of typical dermatitis, bronchitis asthma, allergy rhinitis, chronic hepatitis etc. - problems related to allergic reactions. Reishi inhibits thrombi to facilitate medication absorption; it also has an additive effect that strengthens the prostate gland situated between the bladder and the urinary tract. It has the same effect on the early stage of diabetes mellitus. Bladder infection is accompanied by the usual thrombi formation. Treatments with reishi arrest the latter thus eliminating complications within a short period. Other clinical tests showed that administering reishi instead of insulin can reverse blood sugar level back to normal after one year. The recent discovery that the major flavonoids in skullcap are baicalein and its glycoside baicalin, whereas scutellarin is only a minor component, places the medicinal use of Scutellaria lateriflora in a new light. Baicalein and baicalin are also the major flavonoid constituents in the root of Baikal skullcap (Scutellaria baicalensis). This species is used in traditional Chinese medicine for a range of conditions including allergic, inflammatory and febrile states, conjunctivitis, fatigue, jaundice, headache caused by hypertension, dysentery and enteritis, burns and skin inflammation. Baicalein has been the subject of extensive research. Many studies have demonstrated anti-inflammatory and anti-allergic properties of this compound. The anti-inflammatory and anti-allergic activities of baicalein may involve several mechanisms, such as inhibition of lipoxygenase (but not cyclooxygenase) enzymes, inhibition of inflammatory mediators (histamine, leukotrienes and prostaglandin D2) from mast cells, inhibition of the production of eotaxin (an endogenous compound that recruits eosinophils to sites of allergic inflammation) and other chemokine mediators of inflammation, and inhibition of nitric oxide generation in macrophages. This research on baicalein suggests that skullcap could find new therapeutic uses in the treatment of inflammatory and allergic conditions, similar to the way in which Baikal skullcap is used. Several studies have shown that baicalein has anti-oxidant and free radical scavenging activity. Baicalein appears to be a good scavenger of the superoxide radical, but was found to have no significant scavenging effect on the hydroxyl radical. Anti-cancer activity of baicalin has been shown in vitro in studies with human prostate and bladder cancer cell lines. In the prostate cancer cell study, the anti-proliferative action of baicalin was associated with induction of apoptosis (programmed cell death). Baicalein has also demonstrated anti-genotoxic effect in mutagenicity tests. These recent studies into the biological effects of skullcap flavonoids could be suggestive of new therapeutic applications of both S. lateriflora and S. baicalensis in the future. Reported to have an anti-cancer function for prostate cancer, as well as, esophageal, liver and breast cancer. Dyer's woad have been used in traditional medicine mainly for treatment of infections; specifically, encephalitits, upper respiratory infection, and gastroenteritis. The anti-microbial action of the root is likely more broad-spectrum than that of the leaves. In vitro and studies from China have shown Dyer's Woad root extract to be antibacterial, antiviral, and antiparasitic. Root extracts have been used to treat patients with solid tumors and leukemia, a traditional usage that led to purification of the component compound indirubin. Review of seveal published trials from China found oral administriation of 150-200 mg of purifies Dyer's woad per day led to remission in 60 percent of patients with chronic myelocytic leukemia. Inflammatory conditions are considered a major indication for Dyer's woad. In traditional Chinese medicine, leaf extracts are used to clear heat and toxins from the blood. Saw Palmetto inhibits testoterone action on the prostate. Saw Palmetto also prevents binding of DHT to androgren receptors, hence helps with hair loss. It inhibits androgen and estrogen receptor activity and helps both men and women to balance hormones. Saw Palmetto herb helps treat bladder inflammation and helps with urinary flow. Women also use Saw Palmetto herb to stimulate breast enlargement and also treat uterine irritability. Saw Palmetto is also used to treat impotence, frigidity, and also used as an aphrodisiac. Some new evidience shows that Saw Palmetto may also help with thyroid deficiencies. Saw Palmetto is used to clear chest congestion, treat coughs, asthma, and bronchitis. Increases resistance to the effects of stress and improves circulation and mental functioning. Is has shown cancer-preventive effects and may reduce the the risk of several types of cancer. One study found that among more than 4,600 people over the age of 40, ginseng users were approximately 70% less likely to develop cancer compared to those who did not take the herb. They also found that the more frequently ginseng was consumed, the lower the risk of getting cancer was. Historically Licorice Root has had much success in overcoming adrenal gland problems, stress, Addisons Disease and hypoglycemia (Low Blood Sugar). Rather large amounts can be taken. In dealing with hyperglycemia (High Blood Sugar) smaller amounts can be taken along with other formulas such as the HBS combination. Licorice Root can quench thirst and is soothing to the sore throat. Licorice Root has an anti- inflammatory effect and has some pain relieving effects especially for arthritis. Known mostly for its anti-mutagenic, anti-inflammatory and anti-microbial effects, this herb also has specific cytotoxic activity.